The Spiny-Tailed Monitor (Varanus acanthurus) or Ridge-Tailed Monitor or Ackies dwarf Monitor is an Australian species of lizard belonging to the genus of monitor lizards (Varanus), which also includes the very famous and dauntingly impressive Komodo Dragon (Varanus Komodoensis). 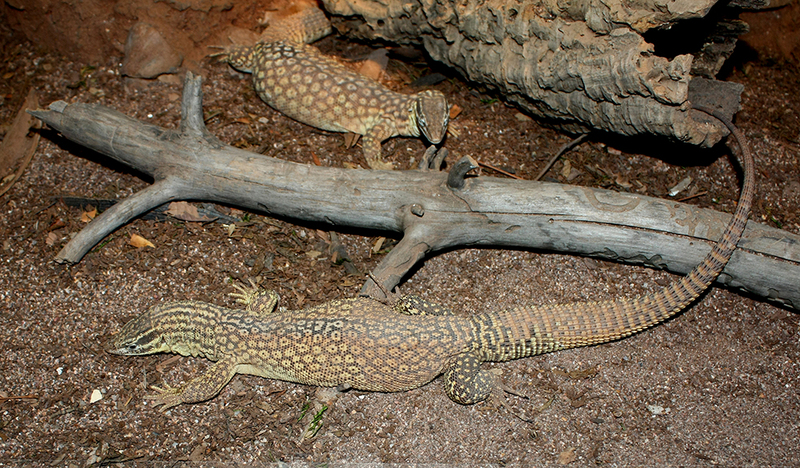 The spiny-tailed monitor, a medium-sized monitor lizard, can attain a total length of up to 70 cm. The tail is about 1.3-2.3 times longer than head and body. The upper side is a rich, dark brown and painted with bright-yellowish to cream spots, which often enclose a few dark scales. Spiny-Tailed Monitors are diurnal [active during the day], solitary ground-dwellers. This species is usually found in its shelter, mainly under rock slabs, boulders or in rock crevices. As the Spiny-Tailed Monitor has a lower level of activity compared to other monitor lizards, as well as a lower metabolic rate, it is often found in its hideout during the day, and most likely it is a sit and wait predator. They prey mainly on insects, especially crickets, beetles and cockroaches, and on small lizards such as skinks, geckoes or small dragon lizards. Less often, this species feeds on other insects, spiders, snails or young marsupials. Approximately 70% of its water requirement comes from food. Click HERE for a Spiny Tailed Monitor care sheet.